Many people suffer from partial or total loss of teeth due to illness or injury. It is known as “edentulism” , and the consequences can cause health problems, functional problems and / or lack of self-esteem. All on 4 dental implant treatment offers a solution to patients suffering from advanced gum disease. The procedure allows teeth to be removed and replaced with dental implants on the same day. Provided the patient has sufficient and good quality amounts of bone, the procedure is highly effective and successful. The procedure “teeth-on-4” consists of placing 4 implants strategically to restore a complete dental arch fixed and a fixed bridge will be supported on the four implants. All this can be carried out in a single day. After your consultation with the dentist, a full jaw radiograph (OPG x-ray) and possibly a CT scan will be taken to examine the amount and location of bone in your jaw. 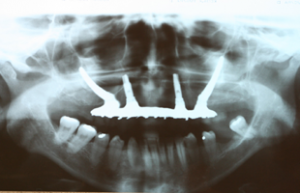 This will allow the surgeon to diagnose if there is enough bone length, width and density to securely place an implant. A thorough examination will also be performed to check that there are no problems present in the mouth before commencing. The operation can be carried out under local anesthesia or intravenous sedation, and is pain-free. The implants fuse with the natural bone over time. This process is called “osteointegration” and gives the replacement teeth maximum stability. Two of the implants are placed at the front of the mouth, taking advantage of the dense jaw bone existing there. The two implants at the posterior of the mouth are fitted at 45º angles to allow maximum stability and avoid the mental nerve in the lower jaw and the maxillary sinus in the upper jaw. During the six months following surgery the implants will fuse with the bone. This healing phase can be affected if hygiene or harmful habits like smoking are not controlled. 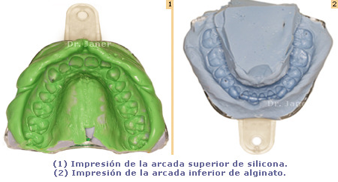 After this time, impressions for a more resistant permanent bridge can be made. 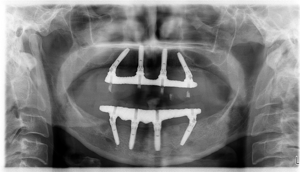 Patients who have lost the posterior bone of the maxillae can be treated with hybrid technique of placing two standard implants in the front and two zygomatic implants in the back. Patients whose maxillae bone is totally lost, both in the front and in the back, can be treated with four zygomatic implants.